This piece is written in three parts; the first after some research in anticipation of meeting WeiZen, the second after we had met; while she was in the process of making the installation for her performance and the third after seeing her perform. Even before meeting this inter-disciplinary performing artist I have been captivated by an image of her in mid-performance. 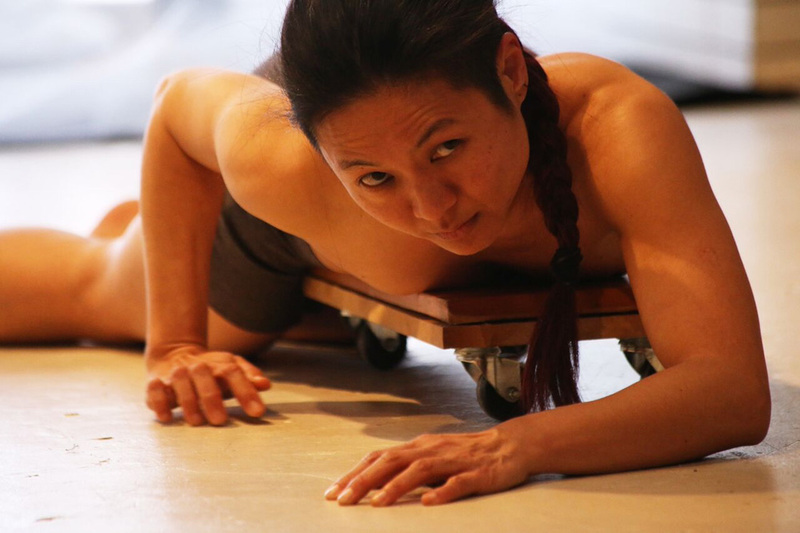 Filling the frame of the shot, a Chinese woman lies belly-down on a wheeled platform, appearing to propel herself along the floor by the sweeping, claw-like actions of her bare and muscular arms. Her legs drag behind her. On her face is an expression of such strength and intrigue I have read it over and over many times, trying to find a meaning. I can’t. It could be anything from admonishment to pain to possession to otherworldly knowingness, maybe even a species of mirth, but it is certainly fuelled by sheer grit and endurance. If eyes alone could speak … but no, in performance art it is the entire body that narrates, and in this image WeiZen Ho walks not, but drags herself. Then again, while legs and feet may not power her, she has wheels, and she rolls smoothly and efficiently, paradoxically (but so effectively) speaking with a look, from a traditionally disempowered space, or actual ‘platform’; lying low and horizontally. This is the power of performance art, and specifically for Ho’s practice, the use of the visceral body and its movement and location in space (or site) as material. In much the same way as a visual artist would use material such as charcoal or paint, here it is the body and its abstract movements in space that relate her particular interest in exploring socio-cultural histories, translated and expressed through her body, as performance. The histories-as-performances are drawn from her own lineage, and beyond, accessing a variety of cultural practices across East Asia; some localised, some carried along by diaspora and others an intermingling somewhere between the two (as is typical of much of this part of sea-connected Asia). WeiZen has spun her performances from the influence of local folklore and mythology frequently interwoven with migration, colonial, feminist and local features. Her solo performance series Stories from the Body (#1-4) 2014 – 16 and performed in Indonesia, Malaysia, Japan and here in Australia presented such powerfully fraught and fractured encounters. In each piece the concept of mediumship was central to her conception, and ultimately, performance. WeiZen’s current collaborative arts project, t h e s u b t l e b e i n g s continues this interest in the performative body as medium. It specifically references her encounters with rituals of possession, shamanism and animism encountered directly in her research and travels over a two-year period to Sabah, Malaysia and Hanoi, Vietnam. 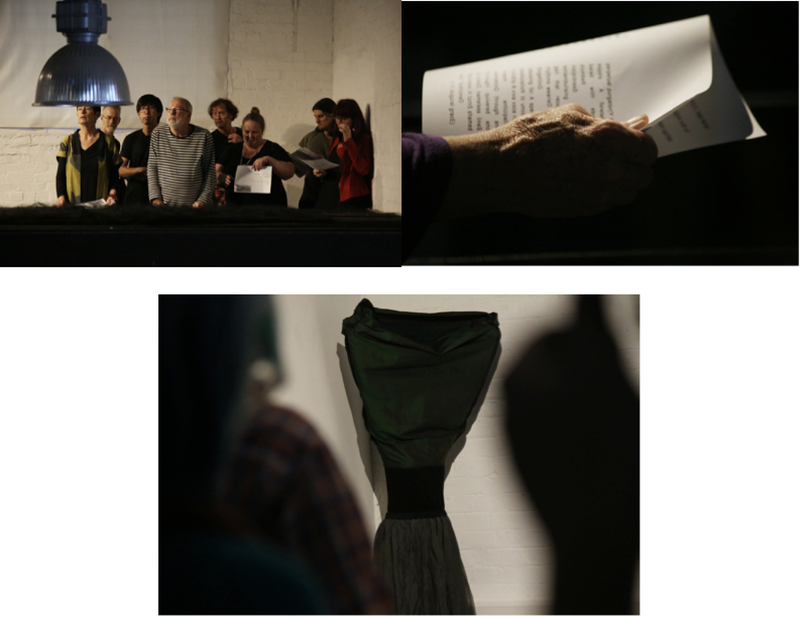 The project’s culmination was the installation at Articulate project space, ultimately realised in a series of performances in March 2018. I meet WeiZen, finally on a Friday. WeiZen and I it turns out, come from the same part of South East Asia and also share a similar cultural history in that we are descendants of Chinese people who fled into what was then British Malaya in the wake of political conflicts. There is a frisson as I discover that WeiZen has visited my hometown Kota Kinabalu, as part of her research trip to Malaysia as well as Hanoi in Vietnam. She has been driven by an interest in researching and witnessing the rituals around trance and possession, rituals that are also a shadowy part of her own socio-cultural history, shaped by time, place and perspective. While in Sabah, she spent time with the indigenous Orang Rungus people from Kampung Minyak, and it is their own whispered description of the origin of their characteristic dance movements that provided the genesis for the title, t h e s u b t l e b e i n g s. WeiZen whispers the actual words the Rungus used, pre-translation, orang halus itu and I am grateful to hear it, for the blanketing sensation of a familiar language, spoken with its rolling r’s, guttural ngs, s liaison and also for the evocation of a distant mirage in which barely discernible figures, the subtle beings move with delicacy and deliberation among a thick jungle. t h e s u b t l e b e i n g s - all lower case, with spaces between the letters. The concept, so eloquently expressed in text, suggests a physical conflation of democratic markers and open spaces. We all have bodies in which we collect lived experiences, yet it is the pauses between actions, the spaces between the trees, the silence among noise, the absences where we are open, and where something may happen. 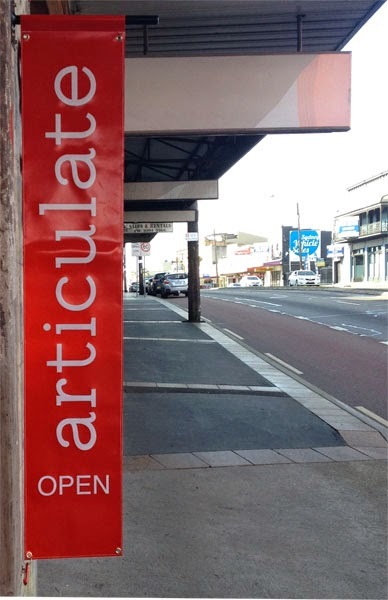 Perhaps a space created for performance, as medium, or as vehicle for possession. In her reflective essay Potus Sedere, WeiZen elaborates on the nature of space as absence, a generative and fertile place for her to work from. there is the notion of possession as the filling in of, and meditating on, many kinds of absences. It makes me wonder about the kinds of qualitative states that may make possession possible: mental vulnerability, uncertainty of social identity, lack of access to deeper communion or devotional spaces, … the thinning veil between life and death, the need for empowerment, unbelonging, dislocation, displacement and uprooting. As a performing artist, her interest is in the point where the performance of ritual-like experiences of being possessed becomes a transformative experience for both the performer and the onlooker. Her intent is to reach beyond the passive performative model and arrive at an active performance, in which the audience is engaged with her actions. An essential aspect of her practice is the continual refinement of a minimally conceived performance methodology; enabling a large part of each performance to be open to improvisation, experimentation and a collaboration of sorts. In person, WeiZen is animated, eloquent and expansive. As we talk she shows me a gesture of her arm, see how much more interesting this movement is (an awkward twisting gesticulation), compared with this (this time, a graceful, balletic flourish). In this I imagine her performance to come, likely to challenge my role as viewer, for her preference for the awkward over ease, in bodily expression as well as conceptual intent. The first phase of the presentation of the t h e s u b t l e b e i n g s at Articulate project space, was an installation in progress. Built gradually over the weeks, it was at once a nest, a building site in transition and a suspenseful stage for the performance to come. The work utilised distinct imagery and material as a response to the research areas. 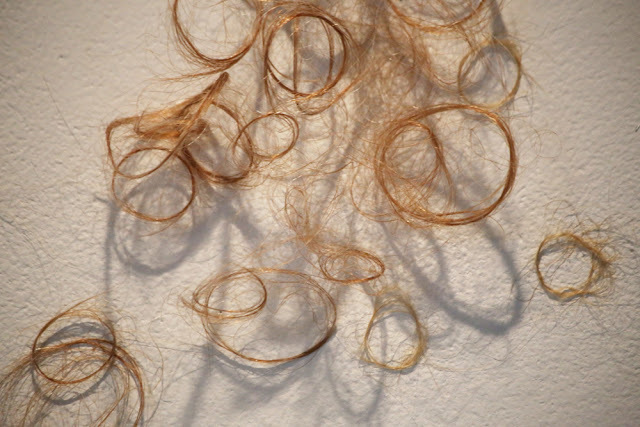 In response to WeiZen’s encounters with the bobohizans of Sabah were hair sculptures, both human and synthetic, loosely spiralled on the walls, suspended in clumps and occasionally entangled with vegetation. These abject vestiges of the body evoked a strange simultaneity of repulsion and attraction. A costume resembling an enlarged slice of skin, with horsehair filaments sprouting outwards is displayed nearby. 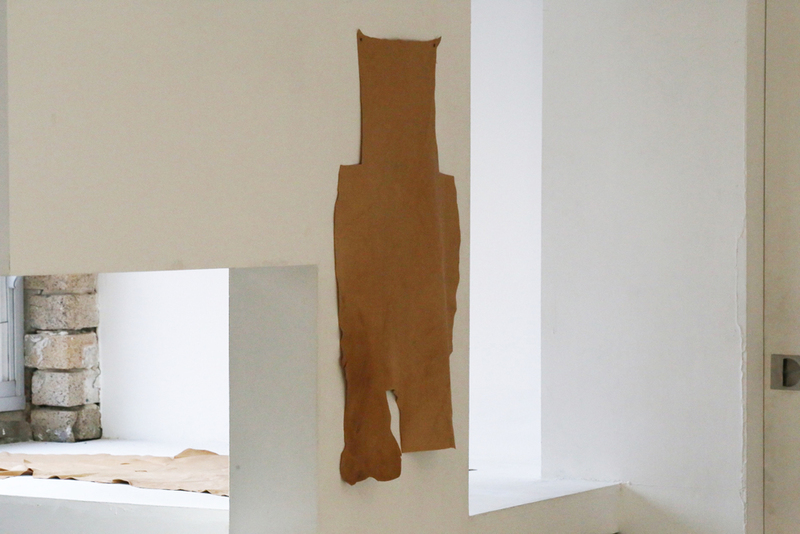 Elsewhere, and among these bodily items were reflective surfaces and motifs – these were WeiZen’s responses to the witnessing of Len Dong rituals in Hanoi and they were installed to invite participatory actions from the audience. 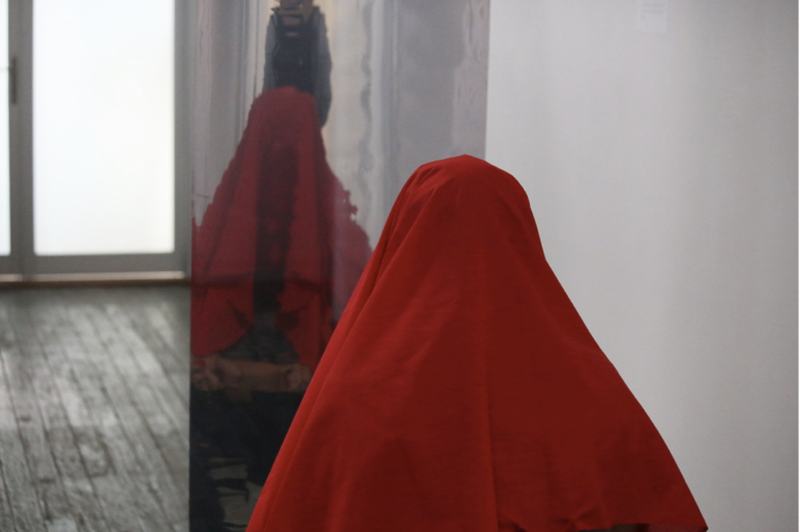 The reflective surfaces act to mirror viewers in the performance along with the artist. In addition to the hair and reflective elements, the proposed performances were to also utilise text, sound, sound circuitry, movement, vocals and video. So the next phase of the project was to move into the series of performances. She walks not but articulates as performance, those s u b t l e b e I n g s, as WeiZen herself says, coming from a basic premise that “all of human living is performed”. I saw the last and final of four performances, held on a Saturday night. The performances had been conceived in relation to the space, which was in turn carefully prepared by the artist and her collaborators as a series of installations and video projections. We were directed to move through the space via three distinct performance pieces, or cumulative phases, all of which evoked aspects of possession and mediumship, cloaked in ritual. At the point of entry ritual helpers received us. These women explained practical details of the performance it had the effect of of clarity and welcome. The gesture was one of kindness. The first performance took place at the far end of the downstairs space, reached by traversing past a video taken in Sabah – and the characteristic percussive gong sounds followed our progress, past the hair installation, which had grown in number, thickness and metaphoric potential. There, by the shrine and a kneeling ritual assistant, we waited, until the heavy anticipation broke and she appeared. Her body, slight and naked, evoked empathy. She was helped into – or onto – the skin-piece – a prosthesis glued directly on to her body. Her long hair was unbound and loosened. Somehow, the fragile projecting filaments of hair from the front of the costume echoed this unfettering gesture and guided her first, tentative actions. Her movements were small, light, subtle as air currents, which she sniffed audibly, her head nodding, swaying, absorbed and apparently oblivious to the audience. Conversely, her arms and hands, held behind the body, wrist to reversed wrist, started to tremble violently, suggest binding or physical resistance. Some, though not all, of her movements stood out to me, hinting at indigenous dance movements local to Borneo. Among a pile of dried leaves on the floor, her toes curled and crawled. There was a walk – of tiny shuffling steps – in which the inner and outer soles of the feet were used and a singular moment when her bare heel extended and knocked on the floor. These were disparate, truncated, remnant actions, broken parts of a language of the body offered up haltingly, not spoken fluently or with grace. This performance closed abruptly when the ritual assistant, who had been holding her, loudly slapped her on the back, propelling her forward and stumblingly into space. and so we intoned in a group incantation, over, through and among other spoken threads. This known or more familiar format of performance was cut with the unknown; she also voiced gutturally, in deep reverberations followed by upward arcs into melancholic strains that suggested the plaintive strains of Chinese opera. Once I thought I heard the circling rise of the Imam’s call to prayer before it dissolved into something else. Aside from the vocal elements, she moved among us, using eye contact and issuing pronouncements – prophetically delivered. Like her bodily movements in the first part of the performance, this was not fluent masterful language but chopped and dislocated parts of utterance. She was with us, but not really, the effect was of a lighthouse beam turning, illuminating something and then moving on. Her movements here, upstairs and with sound were a contrast as they were confident and assured. Without hesitation she climbed a bench, hugged a corner, strode out and spoke up. Having moved from a bodily to a vocal emphasis we were readied for the final performance. During a break, ritual assistants handed out glasses of subtly scented water. So it was with the taste of cucumber-infusion in our mouths, that the final and most dynamic phase of the performance began. She descended downstairs and we, her audience watched, mostly from above, looking down. This juxtaposition suggested disempowerment, an inversion of the raised stage or at the very least dislocation, and cast her in a somewhat abject position relative to her audience. This was amplified as she removed her shirt, crawled on to a reflective rectangle and flipped her hair forward so that a video projection was cast directly on to her naked back. At once she became a fleshy part of the black and white scene. With her hands she took her hair and began to use it. She filled her mouth with hair – a silencing act. She then began to wipe her hair over the flickering images on the floor, appearing to clean, erase or perhaps polish the surface/screen in slow and deliberate actions. With this action, she created a layered temporal ritual in which she occupied, in the one moment. different stratas of time; the past time of the film and the present time of the performance collapsed into one. Connecting these layered temporalities were a lineage of women; the woman on the floor, the women in the projection, indeed all the women who have gone before in performing these traditionally feminised actions, of cleaning, grooming and sewing. In one particularly poignant moment, she produced a large needle and started to sew her hair. Simultaneously, the video image showed another woman tossing her hair. Social, feminine and personal rituals collided. This compression provided a powerful visual narration of mediumship as a type of lineage. Notably, the use of and reference to hair connected us back to the beginning, to the clumped, severed and disembodied hair display forming the hair installation. In a forum subsequent to the performance, one of the ritual helper performers, Damian Oliver offered an insight into interpreting the three performances and the three personas. He thought of them as a movement from the pre-personal, to the personal and then to the trans-personal. So in this work WeiZen Ho moves perhaps from performative representations of being. Initially, of existence without identity – mere stirrings of consciousness. Then, the use of language (loaded with all its own heavy histories) – a socially communicative being. Finally, she enacts a multi-tiered plurality of being - transcendence. This interpretation lends a progressive analysis, in that the performances are enacted as a series of ritual transformations (via possession or mediumship) that are layered and cumulative in effect. So now I have traversed the many faces of her, this WeiZen Ho, from interpreting that initial image, to meeting, talking and walking with her, to witnessing her perform as three hers. Like the enigma generated by that first fixed gaze, her performance work, like most good and interesting art, defies a singular explanation but instead opens up an expanse for interpretation, originating as it does from a similarly expansive field, a hybridization of personal history, place-specific research and socio-cultural ritual. All images courtesy of the artist WeiZen Ho and the photographer Vsevelod Vlaskine. WeiZen Ho, ‘Potus Sedere’ in Part of the Stories from the Body Performance Series; Rabbit 20 – Dance, A Journal for Non-fiction Poetry, RMIT, 2017, pp. 86 - 97 at 90. A Bobohizan is term for high priestess, a ritual specialist and a spirit medium in Kadazan-Dusun pagan rites: Wikipedia. Lên đồng is a ritual practiced in Vietnamese folk religion and the mother goddess religion Đạo Mẫu, in which followers become spirit mediums for various deities: Wikipedia. WeiZen Ho, ‘Potus Sedere’ Op. Cit. at 92. Damian Oliver, collaborator and ritual helper in t h e s u b t l e b e i n g s performance.